Common yarrow, devil's nettle, hundred-leaved grass, lace plant, milfoil, nosebleed, nose pepper, old man's pepper, sanguinary, savory tea, soldier's woundwort, thousand-leaf, thousand-seal, thousand weed and yarrow. Fast growing, will reach its full size in a couple of years' growth. Grows upright, although may need support to prevent it flopping over. Summer flowers and spring/autumn ground cover from the vigorous foliage. Happy on any soil type. Long lasting, deep pink flowers throughout the summer. Cut flowers last well in water and flowerheads can be dried for flower arranging. Narrow leaflets on the pinnately dissected, dark green leaves form a mat of foliage. 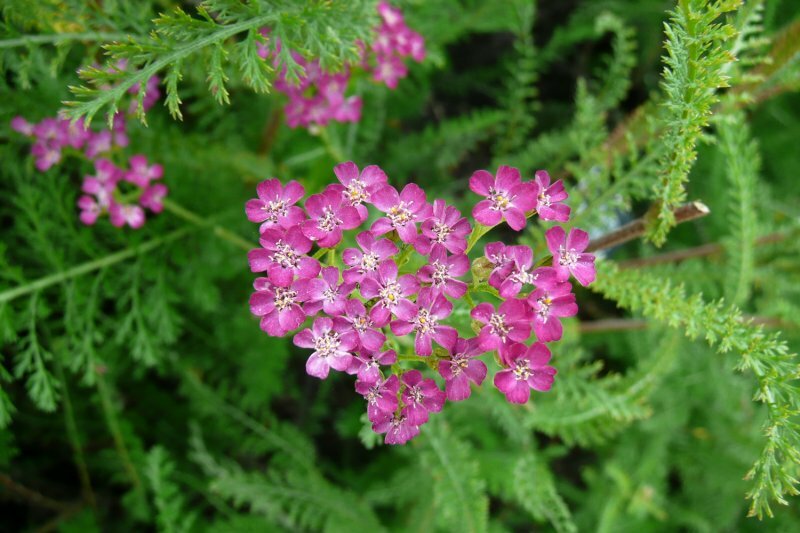 This cultivar is less invasive than the Achillea millefolium species. Summer flowers (eg at the front of a sunny border), dried flowers for flower arranging, deciduous ground cover. Also useful in a wildlife garden as it attracts insects (including ladybirds and parasitic wasps which prey on aphids) or for prairie-style planting. As the stems lengthen they may need supporting (eg with pea sticks or netting stretch horizontally over canes) to prevent them flopping over. Cut back to ground level in the autumn. Divide in spring, take semi-ripe cuttings in early autumn or take basal stem cuttings in spring. The plant should flower in the same year, although it may take a year’s growth before single bud divisions will flower. Can suffer from powdery mildew in hot, dry conditions and aphid attacks. The Achillea genus was named after Achilles, who is said to have used it to heal his soldiers’ wounds after the siege of Troy. Millefolium, meaning a thousand leaves, relates to the large number of tiny leaflets on each plant. 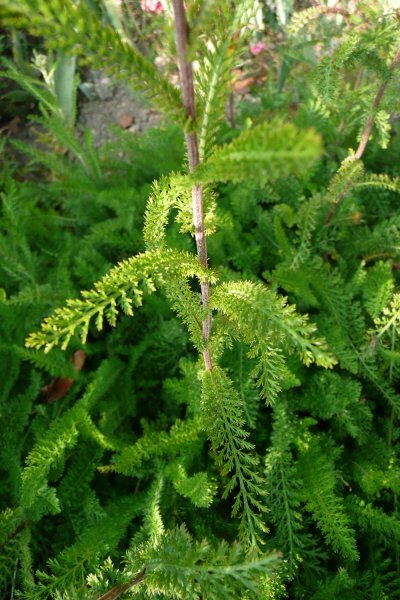 Achillea millefolium is said to have many medicinal uses including being taken internally for fevers, catarrh, arthritis, hypertension and menstrual/menopausal complaints. 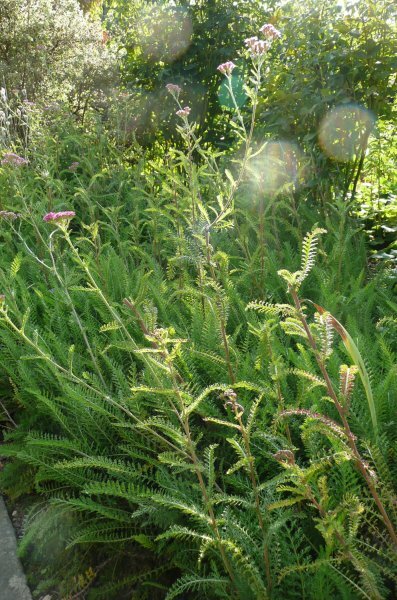 Externally it is used for wounds, nosebleeds, ulcers, inflamed eyes and haemorrhoids. Prolonged use can cause allergic rashes and make the skin more sensitive to sunlight.